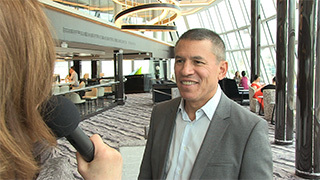 NCL President, Andy Stuart, being interviewed by Open Jaw’s Nina Slawek in the Observation Lounge. Vanessa enjoying the Observation Lounge. 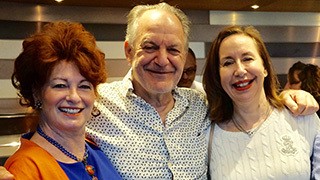 Riding the crest of a very big wave, the Norwegian Bliss, showcased to North American travel partners and media this past weekend in New York City, is very, very impressive. Here are some of the highlights and my thoughts on why I believe this ship will be a huge winner. With the Bliss it is clear that Norwegian has raised the bar and is edging from contemporary, mainstream toward premium -- at the least, to solidly upscale. She is truly an elegant ship full of charm, and, in certain rooms there is a real luxury feel -- such as in the amazing 180-degree Observation Lounge. That space would fit well on any 5-star vessel and is ideal for Alaska cruises. It's cleverly designed with intimate and enticing spots for reading, loungers for relaxing, complementary dark wood bookcases and floor-to-ceiling windows for ocean-gazing. With a calming colour palette of silver, black and dark grey, it is also warm, welcoming and already very popular. They even took out staterooms to make the Observation Lounge as big as it is, underscoring its importance. 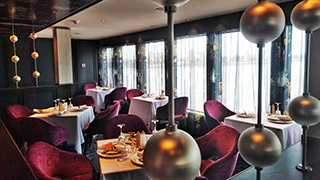 Light snacks/continental breakfast and a casual lunch are served here and it also has a circular bar anchoring the room's centre at the bow of the ship. All in all -- it's perfect. There is nary a flaw on the Bliss and there are many superlatives I could use to describe so many of her restaurants, bars, the stunning Haven (the private enclave) and more. Never mind the top-notch entertainment such as the show Havana which received a standing ovation from the audience and deservedly so. The marquee show is Jersey Boys, which was performed on one night in the presence of Frankie Valli himself -- another treat for guests as the icon came aboard for a meet and greet. 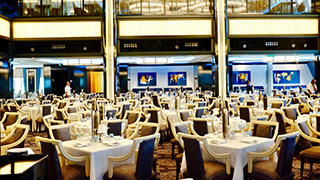 I really loved the small and exquisite Ocean Blue, the spot for seafood on Deck 8 of the atrium space. Also, moving Le Bistro up to Deck 17 was a perfect choice. This little jewel box restaurant is charming, elegant and now has a view. We dined at Cagneys on Deck 8 -- a perennial favourite and had fun at the A-List Bar which is the pre-dinner cocktail spot for both that steakhouse and new Los Lobos for upscale Mexican. Another night we enjoyed a delightful meal in the Manhattan Room, the largest of the main restaurants. In part, it has a two-story ceiling height and also floor-to-ceiling ocean views. It is another incredibly elegant room with an art deco theme and style. A similar sensibility is offered at Mixx which anchors the space on Deck 6 Aft between two more restaurants, Savor and Taste. These are also considered main dining rooms and are intimate and elegant too. The food everywhere was delicious and of high quality (the seafood spread at the Garden Café Buffet blew everyone away). The service throughout was warm, attentive and efficient. Not one bad note. Other worthy mentions: The Waterfront on Deck 8, which continues to be so popular with indoor/outdoor dining options at the aforementioned spots on that deck as well as a few others. The Cavern Club with a Beatles tribute band was enormously popular and the band was spot-on. Another ace for the cruise line. And definitely worth praise: a large bathroom and full glassed-in shower in our mini-suite, charge ports on both sides of the bed and a coffee machine – thank you! The race track was great and worth the queue. 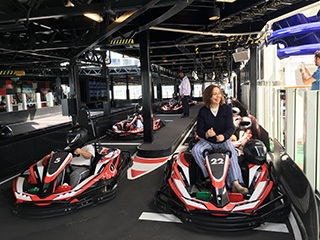 You get eight laps on your go-kart for $7 a ride; it's fun and a must do -- although I think I might have been the only person doing this in a dress and a small-heeled shoe! The Haven (private key card access for the ship within a ship) is more beautiful than ever. 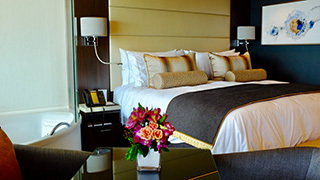 Situated on decks 17 and 18 with 80 rooms and suites, it is all just too fabulous. Do note though that a few Haven Suites are located on Deck 15 not in the Enclave but with total access to same. And again, with a nod to Alaska viewing of glaciers and wildlife, the forward two-storey Horizon Lounge in this space is more than incredible. The Haven restaurant is exquisite as well, and comes with a view. Throughout the ship, I was impressed with the obvious attention to detail; from the fabulous art and sculptures, the lighting -- amazing, clever and often whimsical -- the delicate fabrics and textures, to the overall design and the extensive thought that has gone in to the Bliss. There are FDR imprints everywhere (Frank Del Rio, President and CEO of NCLH Corp, which also includes the Regent and Oceania brands). Yes indeed, a bold statement has been made with the ship and this brand is emerging in a different way. There are still water slides, pool parties, discos and many other typical contemporary features, including the new Laser Tag, but the Bliss offers more -- and in a chic style that cannot be ignored and which has forever changed this brand. The older ships are going through an extensive refurbishment with many millions being spent so that the fleet also, very importantly becomes more homogeneous. I also have it on good authority that sister ship Norwegian Encore, due in Fall 2019, will be even more special and spectacular. 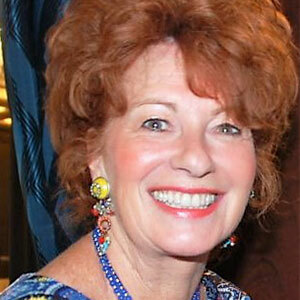 Open Jaw President, Nina Slawek, who also attended the New York unveiling, agrees wholeheartedly. "You can see and feel that Norwegian has invested heavily in building a very, very solid product,” Slawek said. 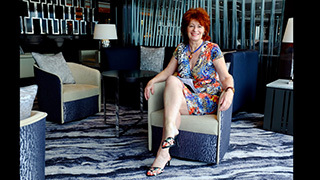 “Travel agents should not hesitate to recommend Bliss to any client. Premium clients will be blown away by the food and the ambiance. And families will love all the activities -- from the go carts to the vertical-drop water slide. Not for the timid! Very well done Norwegian." To all at Norwegian, from President Andy Stuart to every service member: you have achieved a landmark with this ship and I applaud and thank you.